Therefore to this dog will I, Tenderly, not scornfully, Render praise and favour With my hand upon his head Is my benediction said Therefore, and for ever. With each new year comes new opportunity. Week to week, as owners, breeders, owner-handlers, or general enthusiasts watching our favorites, we attend the shows with clear sight on our goals, and fingers crossed. Typically, it is that exciting first win, then perhaps a championship, whether conformation or performance, but frequently the seed blossoms. As our regard for the fancy and various dog sports grows, often does the desire to achieve grander triumphs with the dogs we so deeply admire. We applaud enthusiastically all the winners, because it takes passion, dedication, perseverance, and sportsmanship, as well as considerable time, energy, and financial investment to participate in American Kennel Club and other events. To reach a pinnacle, it takes an extra special dog and exceptional resolve to set records that can become new standards of achievement, elevating our breeds and our ideals to the highest level. 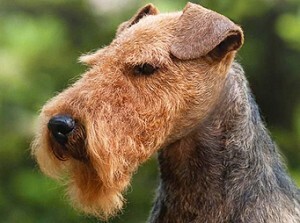 I was inspired to investigate the extraordinary accomplishments in breeding, conformation, and performance of my breed when I followed a Welsh Terrier last year to the apex of Number One Terrier in America. It was exciting to watch “Khaleesi” win many weeks throughout the year, not only Best of Breed and Group One, but also Best in Show. What a thrill when the judge pointed to her (even if it is not your dog, the dog you would select to win)! Watching ringside, I wondered: who are the Welsh Terriers in history who have made it this far or reached different heights? After attending a glittering gala honoring the top seven dogs in the country, I rolled up my sleeves and researched deeply my breed, scouring historical and contemporary journals and books (including those written by well-known authors on the Welsh Terrier—Walter S. Glynn, Capt. I. Morlais Thomas, and Bardi McLennan, to name a few), as well as kennel club catalogs, breed membership history, and The Westminster Kennel Club, Montgomery Kennel Club, and American Kennel Club archives. I talked to many participants—breeders, owners, handlers, and judges—and made many new friends at the AKC as I requested numerous reports. Herein, I highlight the extraordinary accomplishments I found and created a concise list of the Welsh Terrier record holders to behold. Posted by Alex on Sep 14 2018. Filed under Current Articles, Featured. You can follow any responses to this entry through the RSS 2.0. Both comments and pings are currently closed.